Your choice of roof tiles can be a surprisingly cost-effective (and fun!) investment. 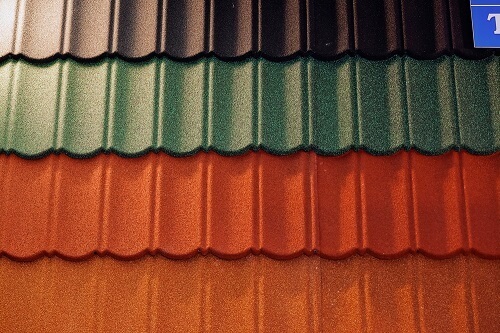 If you’re at the planning stage of choosing new roof tiles, explore your options before you get to the roofing installation phase. You’ll be surprised at what’s possible. Typically, modern roof tiles are made of either concrete or terracotta. Both types of tile have certain advantages for both design and practical uses. Concrete tiles: Concrete tiles are typically cheaper, heavier, and generally considered suitable for any type of roof. There is a wide range of styles, shapes, and colours available. Terracotta tiles: Terracotta roof tiles are among the oldest types of roofing tiles in the world. Their earthy colours and textures are very popular to this day. Terracotta tiles are typically used on all kinds of buildings. It’s a good idea to shop around to get a good understanding of design choices, prices, and suitability for your type of home. You can have a lot of fun selecting the latest roof tiles, so don’t be in any hurry to choose. Do you want light coloured tiles, darker coloured tiles, or a combination of both? Would you prefer to use different coloured tiles for different roof spaces? Roof tile patterns and designs can vary a lot. Have you seen how your tiles will look on a large roof area? Did you know that with terracotta tiles you can use different colours in the same roof? The choice of roof tile may affect installation costs. Have you checked out your costs for different choices? If you are doing a custom renovation, or a new home design, please be aware that you can get any design you want for your roof tiles. Modern roof tiles are far superior products, and can be available in a range of colours to suit any design. It’s really a matter of your personal tastes and preferences. Speak to your designer and your roofer about your needs. Australian roofing suppliers can provide any type of tiles you need, whether you want the very latest Italian tiles or just basic tiles. It is quite possible to get excellent deals on roofing tiles. It’s a good idea to shop around to get a clearer picture of prices, types of tiles, and installation costs. Your local roofing contractors can help you with this, and also give you some tips about tile choices. Most roof tiles have good long product lines, but some tiles are undeniably better than others. Best practice is to invest in top brand tiles, which also come with excellent warranties in many cases, often up to 50 years! Need New Roof Installations in Wollongong or Sutherland? ReKote is your local roofing company in Wollongong and Sutherland for any roofing services you need. Ask us about tile selection, custom tile roofs and help with renovations, new builds, or upgrades. Call us on the local phone numbers below, or fill in our online form and we’ll be in contact ASAP.